Draperies bring classic elegance to your home with their long, flowing style and eye-popping colors and patterns. Here are instructions on measuring windows for draperies, which are usually mounted outside the window frame. Please note that these are just guidelines. You can add size to your draperies as desired. Note on Inside Mount: While you can do an inside mount for draperies, outside mount is far more common. If you wish to inside mount draperies, please call 800-505-1905 to speak with one of our Design Consultants. When placing your order, select the exact width you want your panel(s) to cover. You’ll usually choose one of two options: side panels only or full-coverage panels. 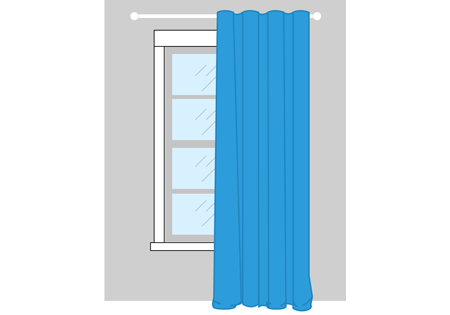 Understanding fullness: It’s important to note that your custom drapes will be made at 200% to 300% fullness, which refers to the extra fabric that goes into the drape. 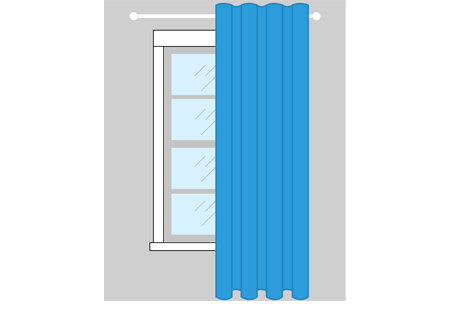 For example, if you order a width of 24”, your drapes will be made with at least 48” of fabric and pleated down to get a 24” width. This gives the drapery a textured look and keeps it from looking flat when closed. However, you may want to order a smaller width if you’re concerned about having too much fabric. Side Panels: Side panels are mainly for decoration, and provide less privacy. This style is not meant to close all the way, instead hanging at the sides of the window. To measure for side panel width, simply measure the width you need the panels to cover, and order at exactly that width. For instance, if you’d like your panels to cover 24", enter 24” as your width. Side panels can also be collapsed to cover less space when desired. Measure the width of the window opening from outside edge to outside edge of the window casing. Add 6" to each side (12" total). Take the total number (your measured width plus what you added to each side), and divide it by the number of panels you want to order. The most common is a center split, which consists of two panels that open to the sides. Order each panel in at least the width you calculated from Step 3. Example: To cover a 48" window with two panels, you would add 12" to 48" (your measured width) and divide by 2 (number of panels) to get 30". The two panels ordered each need to be 30" or wider. Use a pencil to mark where you will mount the brackets for your drapery rod. Measure down to where you want the drapery to hang (usually the floor or bottom of the window). You will use this measurement as your height when ordering. However, do not hang any hardware until the drapery arrives. Choose a length from 10”-30". This style is often used to add the appearance of height to a window. This is a recommended style for outside-mounted draperies. Choose length that will fall 3/8" above the floor. 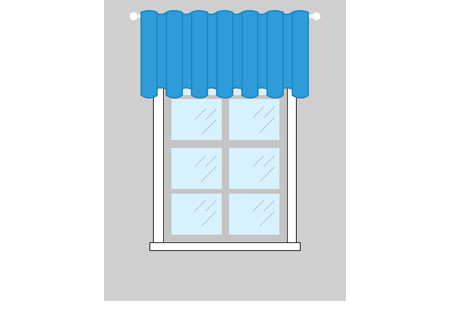 This style is recommended for drapes that will be opened and closed frequently. Choose a length 1”-3" longer than your Rod to Floor Height. This style is ideal for providing extra support in precise mounting situations, such as a ceiling mount. Choose a length 6”-12" longer than your Rod to Floor Height. This style is recommended for stationary panels only. A small "puddle" or "break" often enhances the finished look and is a great way to disguise uneven floors. The finials will add a width of approximately 1” to 7” on each side. You can find these exact measurements on your product’s page. Draperies will not move over brackets. Pleated style draperies consisting of only one panel will need to be attached to the drapery rod with C-rings instead of fully closed rings. This is because there will be extra center support brackets. A full panel is normally used for openings such as a sliding door. With pleated style draperies, pin locations can be different. Most pins can be adjusted up or down to account for your height. Pleated style drapes can work with a traverse rod or a regular rod with rings. Pleated, grommet and rod pocket drapes will have at least 1” fabric headers. Grommet style panels are normally used as decorative panels. 200% fullness is built into the size you order your draperies.